Hamer Singers is Melbourne’s newest choir, directed by Jonathan Grieves-Smith. While building our reputation, we are seeking funding to help underwrite the costs to stage 3 concerts in 2019. HAMER SINGERS was established in 2017 with Jonathan Grieves-Smith, Artistic Director. Jonathan’s international reputation, visionary artistic planning and musical insight attracted a deeply committed body of singers with decades of performance experience. Three concerts are planned for 2019: ‘Before the Morning Star’ on March 31 at St Ignatius Church, Richmond; ‘Baltic Way Freedom Concert’ on 23 August at St Patrick’s Cathedral, East Melbourne; and ‘IKON’ on 16 November in the Ukrainian Cathedral, North Melbourne. These will feature thrilling repertoire over 500 years – works by James McMillan, Robert Ramsey, Baltic and Ukrainian composers. 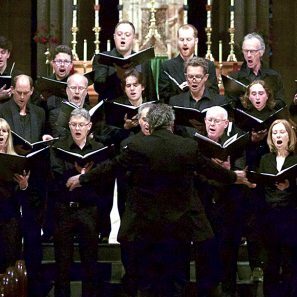 For nearly a decade, concerts by the Melbourne Chorale Ensemble under Jonathan’s artistic direction attracted capacity audiences to St Patrick’s Cathedral. The Hamer Singers is aimed at these audiences, who are again enjoying the beauty and refinement of high-standard ‘a cappella’ and accompanied choral singing. Melbourne is blessed with many amateur and semi-professional choirs, but an artistic director with Jonathan’s pedigree is rare. Trained and steeped in the English choral tradition that has spawned directors such as Stephen Layton (Trinity College, Cambridge), Harry Christophers (The Sixteen) and Stephen Cleobury (Choir of King’s College, Cambridge), Jonathan has generously shared his gifts with many singers around Australia. Under his direction, Hamer Singers is achieving very high artistic standards in innovative programs, and makes a significant, unique contribution to Melbourne’s cultural life. Hamer Singers Inc is managed by a volunteer committee, who collectively represent 80 years’ experience in music/arts management. While our human capital is substantial, as an embryonic not-for-profit organisation, our aspirations exceed our modest financial resources. We are seeking donations to ensure the success of these 3 concerts, which will continue to build our reputation and audience. Hamer Singers aspires to high artistic standards, so the entire concert presentation must meet the same standard. We aim to engage with the wider musical community and with groups who have not traditionally accessed classical music. In 2018, we involved the Lazarus Centre at St Peter’s Eastern Hill. In 2019, we are connecting with Baltic communities (August ‘Baltic Way Freedom Concert’, St Patrick’s Cathedral), and the Ukrainian community (November ‘IKON’ concert, Ukrainian Church, Nth Melbourne). There are material expenses associated with our aspirations. The singers and committee have personally contributed start-up funds. This has ensured a successful beginning and the chance to show the ensemble’s capability. To sustain this momentum, donations will be used to meet the shortfall between ticket sales and the costs to mount 3 concerts in 2019. We maintain modest ticket prices ( $35; Student $25; Child $10) to ensure access for a wide audience. See our website for further information. HAMER SINGERS was established in 2017 with Jonathan Grieves-Smith, Artistic Director. Jonathan’s international reputation, visionary artistic planning and musical insight attracted a deeply committed body of singers with decades of performance experience. This potent partnership has carved a prominent niche in Melbourne’s rich choral landscape. The 50-voice choir performs thrilling repertoire from five continents over 500 years, including works by Orlando Gibbons, Anton Bruckner, Gabriel Fauré, John Tavener, Arvo Pärt, James MacMillan, Ēriks Ešenvalds and others. In establishing this ensemble, the Singers acknowledge their collective debt and pay homage to the Hamer family’s longstanding dedication and legacy to music and the arts in Melbourne.